The Fat Cat housed nearly three hours of nonstop laughter from a group of talented and hilarious women this past Friday. The Ho Ho Ho Christmas Show was a 19+ event produced by Halfhandsome, the talented group that put off “Almost Baymous”, and sold out the LSPU Hall this past spring. The Ho Ho Ho Christmas Show actually came out of “Almost Baymous”. The Racket’s own Stephanie Curran, along with Elizabeth Hicks, had roles in the show and wanted to continue performing sketch comedy. “We decided to do an all girls themed Christmas show to [highlight] all the talented female comedians in town,” said Curran. Along with actor Allison Kelly and comedian, Andie Bulman, Curran and Hicks have formed Fully Gorgeous, all all-female sketch comedy troupe who works in conjunction with Halfhadsome. 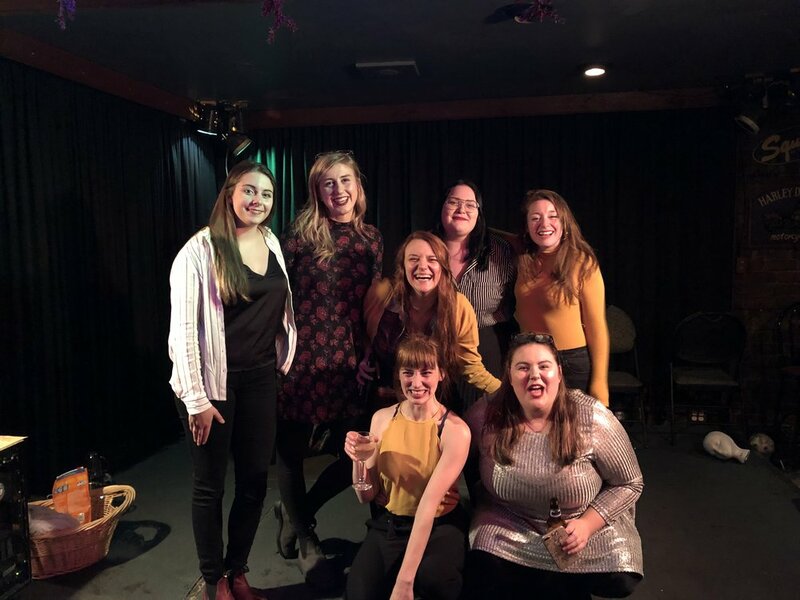 Fully Gorgeous performed a series of eight sketches for the Ho Ho Ho Christmas Show and had comedians Lauren Lambe, Bree Parsons, and Katie Thompson perform stand-up routines as openers. Front Row: Andie Bulman, and Lauren Lambe. “Writing a sketch was terrifying at first, but the more you do it, the more your cares melt away,” said Curran who thinks back to the beginning of the year and said sharing her ideas and writing sketches made her “super nervous”. The Ho Ho Ho Christmas Show took about five weeks to come together. It is not surprising that the writing and editing was the longest part of the process, taking about three weeks. Fully Gorgeous then rehearsed for two weeks. “I would have loved to give ourselves a bit more time, but I think it all turned out fine,” admitted Curran. It turned out more than fine. Curran, the rest of Fully Gorgeous and the 3 openers had the audience laughing from start to finish. The sketches were shining examples of comedic creativity that was as relatable as they were outrageous. That seems to be the key to a good sketch. Ground it in something that your audience can relate to like the Sears Wish Book, working retail during the holidays and blow it out of proportion with hilarity. Everyone can relate to graduating from the “kids table” to the “adult table” at family gatherings. I was reminded by an age-old adage from my father that “nothing good comes out of carrying on” during the sketch in which Curran and Hicks played the older children who bullied the younger Kelly and Bulman especially when Curran got a knock in the face during an intense BB gun war game. Then there are the sketches that completely flip the script on what you would expect. Most are familiar with the three Wise Men out of Bethlehem but do you know about baby Jesus and the three Wise Nans out in the bay? You know they will be excited about the new baby until Coronation Street comes on. In addition, what happens when an overzealous employee organizes a Secret Santa that is a little more Catholic Confession than blind gift exchange? Dirty (and hilarious) laundry gets aired. Another highlight of the show was the sketch in which Hicks donned a classic Christmas cardigan and channeled her inner Vanessa Bayer, playing the classic, stereotypical “mom” character and began setting up the Christmas village with her daughter played by Curran. We even got a reference to the store Rossy before the tone changed and one of the village pieces contained a demon who tried to possess Curran. This allowed Curran to display her love of musical theatre and shine with physical comedy by singing a song from Rent and flossing (the dance move, not the oral hygiene practice). Perhaps the highlight of the show was “Scuff and a Scoff With Nan”, a cooking show starring Curran providing the audience with her slush recipe, an alcoholic beverage that is a Newfoundland Christmas tradition. Nan was not kidding around here, as she shared her recipe, which required a salt beef bucket (empty or even half-empty), Vienna sausage liquid, just about every kind of alcohol imaginable, and the secret ingredient, literal slush, from the Wal-Mart parking lot no less. Curran’s comedic timing made this a standout, we can all relate to the fact that everyone seems to have a different recipe for slush. It was an honor to have been a part of the audience for the Ho Ho Ho Christmas Show. Fully Gorgeous provided a great evening filled with holiday-themed entertainment to get you in the mood for Christmas. It also gave you the sense you were part of something special; something that was just getting started and could be the next evolution in Newfoundland comedy, and that is fully gorgeous.